A tentative agreement to end the six-day strike by Los Angeles teachers requires the Los Angeles Unified School District and Mayor Eric Garcetti to endorse a polarizing measure headed for the November 2020 ballot that would repeal protections of the landmark property tax-cutting measure known as Proposition 13 for commercial real estate. According to a summary of the proposed agreement, the mayor’s office, the school district and United Teachers Los Angeles will “jointly advocate for increased county and state funding” for schools. Garcetti would also endorse the statewide California Schools and Local Communities Funding Act, also known as the Schools and Communities First, a measure supported by the teachers unions that gathered more than 585,000 signatures to qualify for the statewide ballot on Nov. 3, 2020. The membership of United Teachers Los Angeles, which would win a 6 percent pay raise along with caps on class sizes and the hiring of full-time nurses, librarians and other support staff, and the Los Angeles Department of Education was preparing to approve the settlement. The district agreed to try and limit the expansion of privately managed charter schools, which the union said subtracts from funding and resources for the school district. United Teachers Los Angeles President Alex Caputo-Pearl, Garcetti and Los Angeles Unified School District Superintendent Austin Beutner pledged to support the ballot measure, which backers say could raise as much as $11 billion a year for California schools and colleges, affordable housing, emergency services and local programs. The measure would roll back Proposition 13 limits for property taxes on commercial buildings in the most significant change to the state’s property tax system since voters approved the property tax-cutting measure in 1978, cutting tax revenue available for public schools by one-third. Commercial real estate owners and developers have warned that if the so-called split-roll property tax is passed, hundreds of companies could leave California to avoid paying higher state taxes, which in turn could drive up commercial vacancy rates and discourage real estate development in the state. 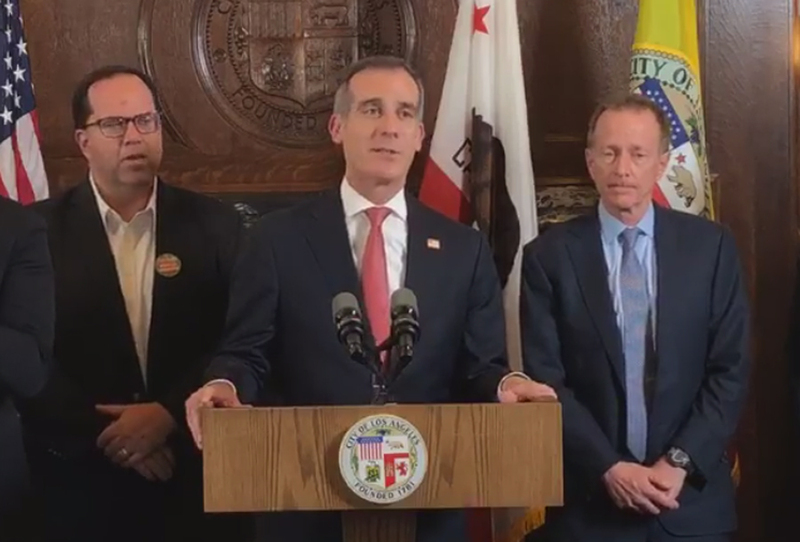 Union leader Caputo-Pearl announced the tentative settlement with Garcetti and Beutner on Tuesday morning after a 21-hour negotiating session. “We couldn’t be prouder to be part of the coalition behind the Schools and Communities First initiative that will be on the ballot in November of 2020, and we’ve all got a lot of work to do to make sure that ballot initiative passes,” Caputo-Pearl said. “The issue has always been how do we pay for it, and that issue does not go away now that we have a contract,” Beutner said. “We can’t solve 40 years of under-investment in public education in just one week, or with one contract. Let’s capitalize on this, let’s fix it. We can make a compelling case to voters across the state and to voters in Los Angeles,” Beutner added. “We can go further and faster,” Garcetti told reporters. While Los Angeles teachers were set to return to the classroom Wednesday, teachers in Denver, Chicago and Oakland, California, are poised to strike by the end of the month, keeping the issue of underfunded public schools at the forefront of political debate in Sacramento and other state capitals. While Gov. Gavin Newsom has not yet endorsed the ballot measure, he described as an “exercise in bringing the parties together to see if we can compromise on a more comprehensive tax reform package” during a recent meeting with reporters, according to the Los Angeles Times. Newsom could broker a deal with the state legislature to avoid putting the measure on the ballot under a 2014 state that allows backers of an initiative to cancel their efforts after turning in signatures. In another move potentially undermining Proposition 13, Assemblywoman Cecilia Aguiar-Curry, a Democrat from Winters, California, introduced ACA 1, a state constitutional amendment that would reduce the two-thirds voter majority required to pass local bond measures for affordable housing construction to 55 percent. Dave Bragg, managing director of strategic research for investment adviser Green Street Advisors, described the split-tax initiative as “a greater and more imminent threat” to commercial real estate owners than last November’s failed ballot measure to repeal the Costa-Hawkins Act, which would have allowed and local municipalities to impose rent control. Both commercial tenants and landlords would feel the pinch of higher property tax payments if the split tax is approved, Bragg said.